Graceful failover allows a node to be removed from a cluster proactively, when the cluster is healthy, and all data is available. Graceful failover allows a Data Service node to be removed from the cluster proactively, in an orderly and controlled fashion (say, for the purposes of system-maintenance). It is manually initiated when the entire cluster is in a healthy state, and all active and replica vBuckets on all nodes are available. A complete conceptual description of failover and its variants (including graceful) is provided in Failover. 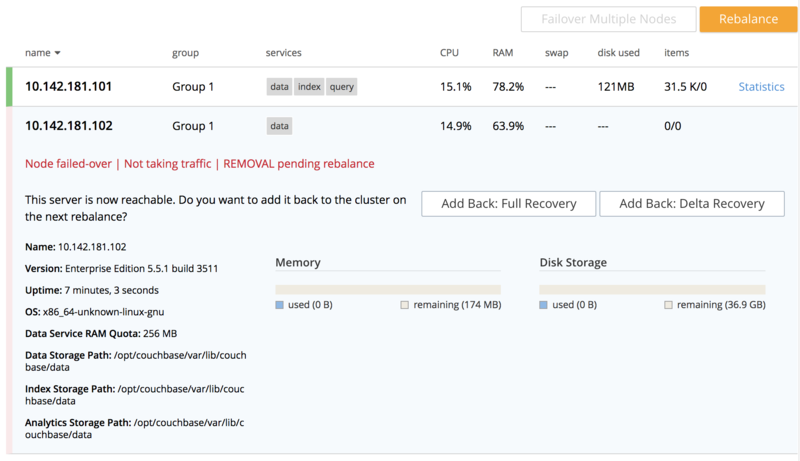 A two-node cluster already exists; as at the conclusion of Join a Cluster and Rebalance. The cluster has the Full Administrator username of Administrator, and password of password. Two radio buttons are provided, to allow selection of either Graceful or Hard failover. Graceful is selected by default. Confirm graceful failover by left-clicking on the Failover Node button. For server-level details of the graceful failover process, see the conceptual overview provided in Graceful Failover. 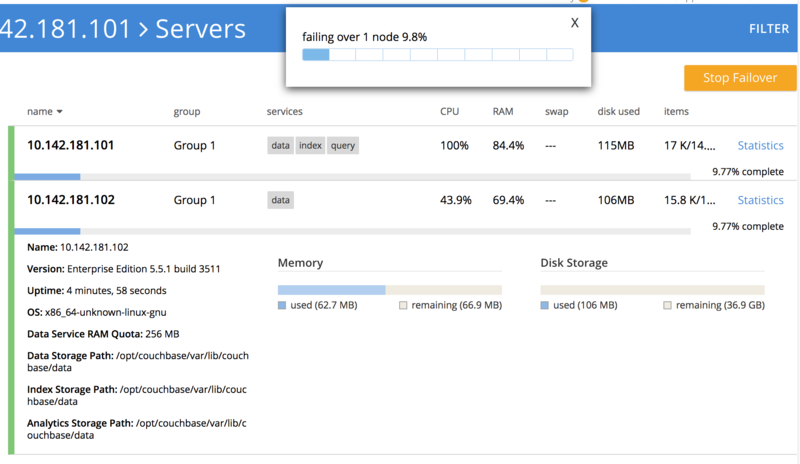 This indicates the graceful failover has successfully completed, but a rebalance is required to complete the reduction of the cluster to one node. Node 10.142.181.102 has successfully been removed. The --server-failover flag specifies the name and port number of the node to be gracefully failed over. For more information on failover, see failover. For more information on rebalance, see rebalance. For more information on /controller/startGracefulFailover, see Setting Graceful Failover. For more information on /controller/rebalance, see Rebalancing Nodes. A hard failover can be used when a node is unresponsive. See Hard Failover.